There’s something right about an old Charger going through a resto. This sweet specimen belongs to reader ajhellman, and from what we can tell it’s going to be a hell of a ride. He’s kind enough to give us a bit of the downlow on the project. 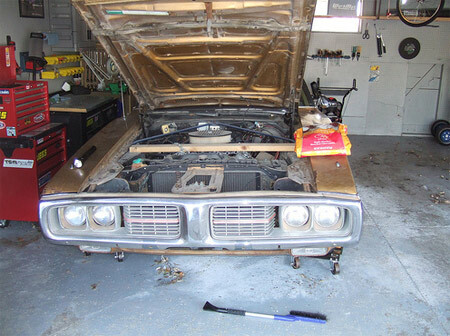 My biggest project, a ’73 Dodge Charger SE restoration that I started back in sophomore year of college. The engine, front & rear suspension is done and the transmission is in the basement just about complete, ready for some warmer weather so I can put it back in. Current project is to weather-strip the garage door opening because it’s a cold place to work right now! Auto work is never fun when you’re freezing your lug nuts off, so we can commiserate with you there. Other than the guys on Ice Road Truckers, I can’t think of anyone who digs cold-weather car work. your gonna need more tools than just a snow scraper! A friend and I are working on a 68 Camaro RS. It’s darn cold right now in College Station at night, and that’s when we have time to work on it. But we’ve managed to convert over to four wheel disk LS1 brakes, rebuild the rear end, replace the steering linkages, and throw in some 2″ drop springs. You’re right Joe, but being old American iron, they can leave the metric wrenches in the tool chest. He bought it off the show room floor, in 1968….. 440 thermo quad. We are putting a new tub front suspension, and a 1000+ hp engine. Aside to Shopmonger. You’re not really going to cut a a primo ’69 Charger.